The Whole Foods in Bedford Marketplace is undergoing a Multi-Million Dollar interior renovation. The 41,750 square foot space started out as a Purity Supreme supermarket. In 1995, Purity was bought out by Stop & Shop. The space then reopened as a Natures Heartland in 1996 (it didn't make sense for Stop and Shop to have 2 stores in Bedford). In 1999, Nature's Heartland was acquired by Whole Foods and the Bedford Store was converted to a Bread & Circus Whole Foods Market. 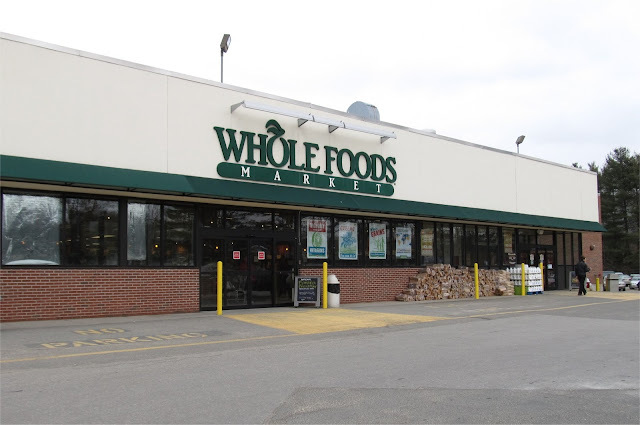 In 2003 the name was changed to Whole Foods Market. The current store employs well over 100 people. I recently spoke with Carol Ortenberg, Marketing Team Leader and Community Liaison for the Bedford Whole Foods. Carol mentioned the primary purpose of the renovation is to expand the offerings for it's customers. They want to try out some new opportunities in dining and food that customers have asked for while also modernizing the look and feel of the store. The prepared food area is undergoing major changes with expansion of the salad bar to incorporate a larger selection of items including more hot bar options. A Soup and Rotisserie Chicken station is being added along with stations for Dim Sum and Mexican Burritos. The pizza area is being expanded and a made to order sandwich counter is being added. The Produce Department is enlarging and upgrading with a new station for cutting fresh fruit along with a new sit down Coffee and Juice bar that will feature fresh squeezed juices and possibly vegetables juices. The floral department is also expected to move. Along with these renovations, Whole Foods is also building a new cooking department. This department will hold cooking demos and will also feature a cooking coach that customers can speak to about recipes and how to make specific dishes. Carol mentioned that although they are working on the renovation, they continue to remain focused on supporting Bedford and the surrounding communities. For example after Valentine's Day, they donated 60 bouquets of flowers that were delivered with Wheels on Meals to seniors in Bedford. Whole Foods also recently worked with Davis school to help them set up a small temporary grocery store called Davis Town, so kids could experience and learn about grocery stores such as how to be a cashier. While the recent stormy weather has pushed back the renovation schedule a little bit, it is expected to be completed by early May. Whole Food is planning some type of opening event to celebrate. While it's the interior that is being renovated, there have been a few tweaks outside. 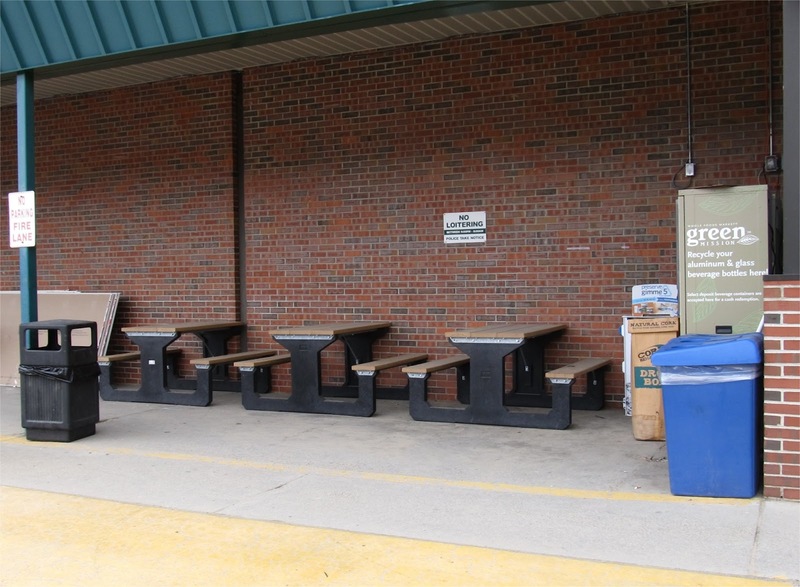 An outdoor seating area was recently set up and they plan to continue to tweak and beautify this area over the next few months. The Bedford Marketplace shopping center as a whole was scheduled to undergo a significant makeover a few years ago with a Pedestrian Greenway, Outdoor Restaurant Seating, over 50K square feet of new retail space along with updated facades for existing retailers such as Whole Foods and Marshall's. However these plans were put on hold when the economy slowed in 2009. It's good to see the Whole Foods undergoing a renovation. Compared to other location, the Bedford store had begun to fall behind especially in the prepared food sections. It will be interesting to see if the expanded hot food stations will drive additional lunch traffic from local companies. While the Whole Foods has attracted a sizable lunch crowd, my observations indicated it primarily tended to be individuals rather than groups of workers. The wider range of prepared food options may persuade more groups to make Whole Foods a lunch option. With Wegmans set to open in Burlington in the Spring of 2014, local competition will likely increase. Whole Foods seems focused on having individual stores directly market to local communities. For example, the Bedford Whole Food store promotes it's specials and answers customer questions and concerns on both it's Facebook and Twitter pages. Some supermarkets such as Shaw's, have a single Facebook and Twitter account that serve all it's stores, while others such as Stop & Shop do not appear to even have an active Facebook or Twitter account. Labels: florist, Food, grocery, home meal replacement, market basket, pizza, produce, renovations, Restaurants, salad bars, shaws, shopping centers, stop and shop, supermarket, sushi, wegmans. The past few year have seen a number of Solar Power R&D companies make the move to Bedford. Spire Corporation provides equipment and technology to help companies manufacture solar panels. Joule has developed a process to convert solar energy into liquid fuels such as diesel and ethanol. The company which has raised $110 Million, has recently opened a demonstration plant in New Mexico to commercialize the technology. 1366 Technologies has developed a more efficient process to manufacturer solar panels at significantly lower cost. The company which has raised over $80 Million from a combination of private investors and federal grants, recently moved to Bedford where is has just opened a demonstration plant. What's interesting is that Massachusetts is one of the top states in terms of growth in both home solar systems and solar energy research. A good portion of the growth of home solar systems in Bedford appears to be a result of the no money down solar leasing programs while many of the solar energy companies have spun out of research at MIT and other local universities. From a retail perspective, it's likely that the high percentage of new home solar systems being leased is precluding the need for a solar power consumer showroom in Bedford (with leasing most home owners don't get to pick out or design their system). It would be interesting for one of the Solar R&D companies in town to open up a small storefront showcasing their technology. Great Clips is set to open soon at 319 Great Road in the Great Road Shopping Center at the location formerly occupied by Capelli Salon. According to their web site, Great Clips has over 3,000 Salons in the United States and Canada. While they appear to only offer walk in service like Supercuts, Great Clips offers online check-in via their web site or mobile apps. This seems to work like call ahead seating for restaurants. Stay tuned for more information. The past few years have seen a big increase in the number of national haircut/salon chains in the local area. Supercuts opened a few years back at Blue Ribbon Plaza in Bedford and recently opened in Lexington. Snip-its has recently opened in the Burlington Square Shopping Center while Floyd's 99 Barbershop just opened in Woburn. The Atlantis Sports Club & Spa recently opened at 44 Middlesex Turnpike inside of the DoubleTree Hotel. The fitness center also features a pool and tennis courts. It's interesting to see a Bedford hotel open it's fitness center to local residents and nearby employees. The Burlington Marriott has offered membership to it's fitness center for many years. Atlantis has 9 locations (7 in the Boston area and 2 in the New York City area). All of their locations are located in hotels. In many cases, hotels outsources their fitness center/spa to an outside company. The outside company usually renovates/expands the center at their cost and markets it to nearby residents and employees. The outside company then pays rent for the space and typically will share a portion of the revenue it receives from members with the hotel. Depending on the arrangement, the fitness center may get a different name than the hotel.